"It seems as though I have a penchant for being around the wrong people." David Morales (Lopez) is a typical college student trying to make it through school while playing on a soccer scholarship, that is until a knee injury hampers his playing time and ultimately costs him his scholarship. Left with no money to finish school, he takes a job working for an startup biotech firm as a courier. His job is simple, although not entirely legal—take samples across the border into Tijuana where they can be tested on animals without the harsh fines levied in the United States. At first the job seems to be turning David's life around, as he is able to pay off his tuition and then some. But things turn sour when he is caught up in a web in which he is the central suspect in a brutal murder, and is the only person that can save a dying gangster. All of this falls on David because he is in possession of a red cooler that contains the key to his freedom, as well as that of his mother, as his employers have kidnapped her in order to ensure David's delivery of the cooler. To be perfectly honest, I was set to dislike Outta Time on appearances alone. I put off watching the disc to the last possible moment and I let out a small groan when the opening images began flickering across my television. Imagine my surprise, if you will, when I became caught up in the film. Here is a movie that makes no pretense about its objectives; it is a fast-paced, often implausible thriller that sets out to entertain and it does just that. Told in a straightforward manner, there is rarely a moment when Outta Time slows down to explain the plot or to even offer a deep look at the characters. While this would seem to be a mistake, in Outta Time I was grateful for the breakneck pace and the few glimpses of character development prove they would hamper the flow. Throughout the course of the film, the viewer learns little about the motivations of the FBI officers tracking David or why the murder he is being framed for occurred in the first place. The script is often lagging behind the direction and editing in terms of both structure and quality, which drops the overall quality considerably. What separates Outta Time from the countless other direct-to-video action films that seem to come along each week is that the direction of Lorena David often matches the quality seen in recent blockbusters. David's style, while not wholly original, is certainly never dull. David finds the right balance and has crafted a film that, while lacking in script and character development, is fun to watch. 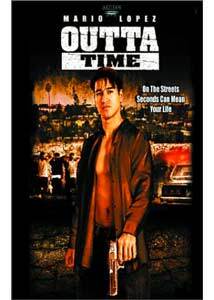 The acting is also of a higher quality than is often found in low budget films; Mario Lopez does a fine job as David, offering charm as well as an understated toughness. Ali Landry (the Doritos girl) is good in her role, though her character seems to only serve as David's motivation. Still, she has a nice chemistry with Lopez and their scenes never feel forced. Image Transfer Review: Presented in 1.85: anamorphic widescreen, Outta Time features an uneven transfer. The exterior shots of Mexico and San Diego (the two primary locations) are quite nice with good sharpness and detail, but has a sort of haze that gives the image a soft look. The tans and browns used in the film come off well, while black levels show some grain in several scenes. As nice as those scenes look, the nighttime scenes look murky in comparison with excessive grain. Edge enhancement is noticeable in places, while contrast is an in others. A slightly cropped full-frame transfer is also offered. Audio Transfer Review: The Dolby Digital 5.1 mix for Outta Time is well done; the climactic action sequences in particular show off the split surround speakers nicely. A shootout in a Tijuana bar sounds terrific as the sound of bullets and bottles shattering fill the room, rivalling many of the demo discs that I own. Dialogue is crisp and clear throughout, while the .1 LFE channel remains dormant for much of the film. Extras Review: A commentary track by director Lorena David, producer Mark Roberts, and actor Mario Lopez leads off a nice selection of extra features. While it can be argued that there is little to be learned from the commentary, the three have a nice rapport as they discuss the film. David talks about shooting the film while Roberts and Lopez discuss mistakes, shooting in San Diego and Tijuana, as well as the numerous friends and family that appear in smaller roles in the film. David is the best spoken of the three; she is more focused on discussing the making and shooting of the film. A separate track for her would have been nice, but the three get along so well that, as it stands, it is worth a listen. Rounding out the extra features is a short behind-the-scenes featurette, hosted by Nancy O'Dell, that while largely promotional is worth a look. Lopez and Landry are the two most prominently featured members of the cast interviewed, while a look at the stunts and a brief discussion of the small budget are also offered. Twelve images appear in a photo gallery that is largely focused on Lopez and Landry, though it should come as no surprise that the beautiful Landry gets the lion's share of images. The theatrical trailer rounds out the disc. While I have trouble loudly praising Outta Time, it would make for a nice rental if you are a fan of the genre. This is a nicely made film that deserved a script that would showcase the talents of an interesting director.